Apologetics (giving a rational defense of one's beliefs) is an intellectual endeavor, but the consequences can be quite practical. Since people often act on their beliefs (e.g., helping those in need because we believe that it's the right thing to do), defending true beliefs and refuting false beliefs will occasionally be a matter of life and death. 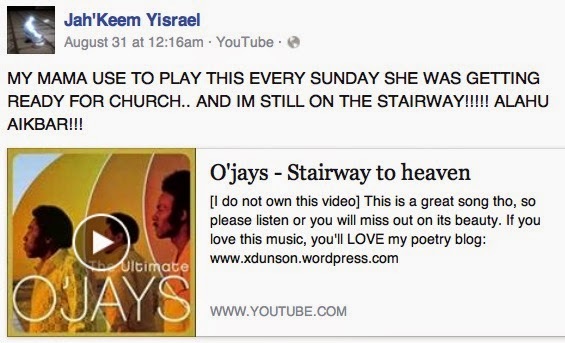 Take Oklahoma beheader Alton Nolen (who now goes by the name "Jah'Keem Yisrael") as an example. However, as evidenced by his complete ignorance of basic Christian doctrine, he was given absolutely no intellectual foundation. When he was eventually presented with a variety of objections to Christianity in prison, he converted to Islam. Let's look at a few of Nolen's posts to see what would have happened if he had encountered a Christian apologist. John 1:3—All things came into being through Him [Jesus], and apart from Him nothing came into being that has come into being. Colossians 1:16—For by Him [Jesus] all things were created, both in the heavens and on earth, visible and invisible, whether thrones or dominions or rulers or authorities—all things have been created through Him and for Him. Mark 2:5-12—When Jesus saw their faith, he said to the paralyzed man, "Son, your sins are forgiven." Now some teachers of the law were sitting there, thinking to themselves, "Why does this fellow talk like that? He's blaspheming! Who can forgive sins but God alone?" Immediately Jesus knew in his spirit that this was what they were thinking in their hearts, and he said to them, "Why are you thinking these things? Which is easier: to say to this paralyzed man, 'Your sins are forgiven,' or to say, 'Get up, take your mat and walk'? But I want you to know that the Son of Man has authority on earth to forgive sins." So he said to the man, "I tell you, get up, take your mat and go home." He got up, took his mat and walked out in full view of them all. This amazed everyone and they praised God, saying, "We have never seen anything like this!" John 13:13—"You call me 'Teacher' and 'Lord,' and rightly so, for that is what I am." Notice that simple familiarity with the Bible is enough to easily refute all of Nolen's objections. Let's look at another. (1) Nolen asks, "Why would the Father Jesus as you say be coming back to earth." Nolen is clearly ignorant of basic Christian theology, because we don't say that Jesus is the Father. Matthew 25:31-33—"When the Son of Man comes in his glory, and all the angels with him, he will sit on his glorious throne. All the nations will be gathered before him, and he will separate the people one from another as a shepherd separates the sheep from the goats. He will put the sheep on his right and the goats on his left." John 5:22-23—"Moreover, the Father judges no one, but has entrusted all judgment to the Son, that all may honor the Son just as they honor the Father. Whoever does not honor the Son does not honor the Father, who sent him." (4) Nolen challenges Christians to show him that Jesus is God. The passages we have already looked at show that Jesus is God. But for a fuller discussion, see my article "Where Did Jesus Say, 'I Am God, Worship Me'?" Perhaps Nolen has something more significant in his next post. NIV—No one has ever seen God, but the one and only Son, who is himself God and is in closest relationship with the Father, has made him known. NASB—No one has seen God at any time; the only begotten God who is in the bosom of the Father, He has explained Him. ESV—No one has ever seen God; the only God, who is at the Father's side, he has made him known. NRSV—No one has ever seen God. It is God the only Son, who is close to the Father’s heart, who has made him known. Is this verse supposed to refute belief in the deity of Christ? Because when we actually read the verse, it specifically says that Jesus is God. John 14:7—"If you had known Me, you would have known My Father also; from now on you know Him, and have seen Him." The level of ignorance here is astounding. (1) Nolen declares that the Dead Sea Scrolls were taken out of the Bible, as if the scrolls were originally included in the Bible but were later removed. This is nonsense. The Dead Sea Scrolls are a collection of nearly a thousand scrolls, some of which are copies of Old Testament books (e.g., Genesis, Exodus, etc. ), while others are deuterocanonical (not included in the Jewish canon of scripture). The texts that were included in the Bible are still in the Bible, and the texts that didn't still aren't. So which texts were removed? 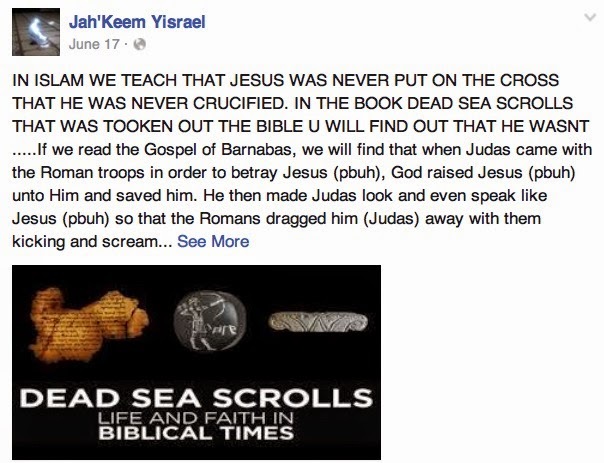 (2) Nolen says that the Dead Sea Scrolls claim that Jesus never died. Since the Dead Sea Scrolls aren't about the life of Jesus, we can only wonder how they say that Jesus didn't die. (3) Nolen apparently believes that the Gospel of Barnabas was part of the Dead Sea Scrolls. But the Gospel of Barnabas is a medieval forgery written more than a thousand years after the time of Jesus and was certainly not one of the Dead Sea Scrolls. It was written in Italian! Putting all of this together, we can see that Nolen (1) knows nothing about Christianity, but (2) thinks that he has a knock-down case against Christianity. If Nolen had been given a basic foundation in apologetics, he wouldn't be arguing any of this. When confronted with arguments against Christianity in prison, he would have been able to refute them. But it gets worse. 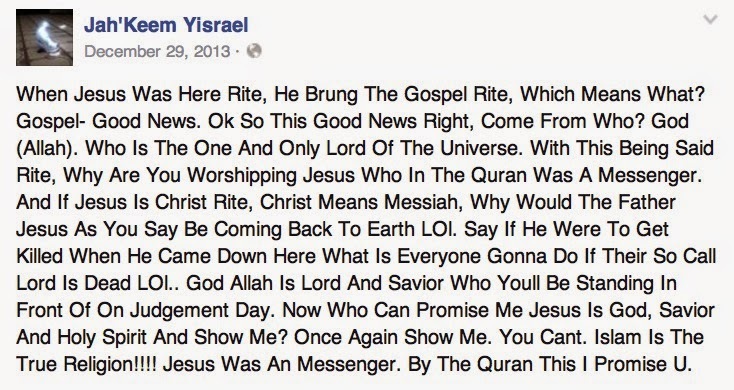 When he went to prison, Nolen was just as ignorant of Islam as he was of Christianity. This allowed Muslims to convince him that Islam is the truth. Once he became convinced that Islam is the truth, he learned about jihad, terrorizing non-Muslims, and beheading. He eventually decided to wage jihad by committing a "lone-wolf" attack, beheading a woman and stabbing another before being shot. If Nolen had met a well-informed Christian apologist before, during, or after his conversion to Islam, I don't think we would ever have heard of him, because I don't think he would have gone on a killing spree. Apologetics, then, can save lives. It's time for Christians to equip ourselves to defend the Gospel and to refute Islam. Great work Dr. David. I seriouslly wanna become a christian apologetic since I have a lot of muslims folks around me. Thanks for shewing more light to the world of false belief. The thing is that Satan can make you forget bible verses. Muslims are allowed to lie to bring people into their religion. 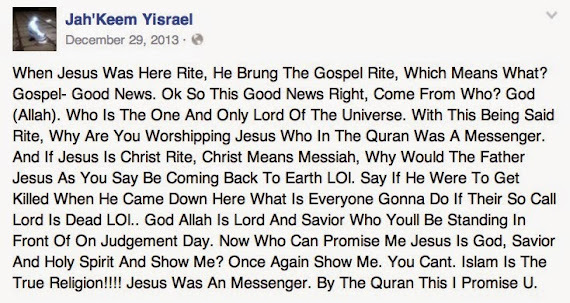 As CL Edwards can tell you Muslims first get people to doubt the word of God, and after they have created doubt they present the quran as the uncorrupted word of God. Christian apologists, sadly, can do little to stop conversions to Islam because Muslim faith is not dependent on evidence. We need to understand that Islam is simply the cult of Muhammad under the pretext of monotheism. If Muhammad had depended on real evidence for his claim of divine selection then Islam would have been stillborn. Although Muslims often talk about evidence, their resort to evidence is totally dishonest. The only "evidence" that Muslims will consider as being valid is that which "proves" Muhammad to be a true prophet. The cult mentality of Muslims render them incapable of engaging with REAL evidence because they instinctively know where this evidence leads. Such evidence is simply denied or explained away albeit unconvincingly. Muslims have no qualms about sacrificing their intellectual integrity if it helps to sustain their faith in Muhammad. Please keep this up David. It's not only Nolen we're talking about. In the Quran (2:221), it seems like Muslims are prohibited to marry non Muslims and hence, whenever a non Muslim were to marry a Muslim, a conversion is in most cases compulsory. I do know that many countries (and in fact many "moderate" Muslims) don't see this as a hard law, but where I come from, the government plays its part and forces a conversion before you can marry a Muslim. So obviously this includes Christians who convert to Islam to marry a Muslim too. You brought up the subject that Christians have to educate themselves with Christianity sufficiently. I couldn't agree more. We ourselves can become apologists of a certain level in our own right. We must know WHY we believe. It isn't sufficient to just go to church every Sunday and listen to the pastor. We must do our own research and look for facts and proofs. A former Catholic woman who converted to Islam to marry her Muslim husband wrote to the one of our newspapers recently asking why are people fighting in the name of religion. This woman, while possibly sincere in her intentions, obviously knows not much about Christianity (otherwise she would not have converted to Islam ala Alton Nolen) or Islam (otherwise she wouldn't have asked such a fundamental question). You are right. Even a smattering knowledge of Christianity is sufficient to knock out the wind from Islamic doctrine. The reality sadly is that politically correct and liberal thinking as made us spiritually poor. Christians in west are turning to religions of the East imagining that they have access to peace that passes understanding. They do not. And those that call on the Religion of Peace is nothing more that a Religion of Piece. Since all Three Persons, The Father, the Son, and the Holy Spirit (Matthew 28:19), all equally occupy the same very highest office of power and authority in heaven, and ‘God’ being the very highest title, then all Three have to be called God. The term “one God” in Scripture means the one and only highest office equally occupied by the three Persons bearing the same highest title of ‘God’ (God/King “the King of heaven” Daniel 4:37). But Muslims will argue that the triune God, or Trinity, or three Gods/Kings (working as one in the highest position of authority in heaven), is polytheism (multiple gods). But the term ‘polytheism’ is applicable only to created gods/beings. The eternal triune God is the original source of all life and all other gods/beings would not even exist without an eternal first cause. The eternal first cause is the triune God, the three Persons, all with the highest title of ‘God’ (God/King) who operate together as one (e.g. “I and My Father are one” John 10:30 and 15:26) team or family, and who existed in eternity before the creation of the universe (Genesis 1:1; 1:27). They are not three finite and limited pagan gods. And polytheism (worship of multiple gods) would not exist at all without sin having entered into the world in the first place, after it was created. As the Creator, the “Lord your God” of the Old Testament, who is Christ, the Son, the Word (John 1:1-3), also commanded: “You shall have no other gods before Me” Exodus 20:3. The righteous holy Persons of the triune God of the Bible cannot be called something idolatrous and evil like ‘polytheistic’, since they were together in eternity long before idolatry and evil even came into existence, and they have not nor will ever change or become corrupted (Malachi 3:6; Hebrews 13:8; Romans 1:23; Isaiah 57:15). Great job, and God Bless you guys abundantly. I absolutely agree that Christians should be well equipped. We all know that the BIBLE is our sword. We must know how to handle and understand it. David, You hit the nail on the head. I was almost led astray too by Islamic lies and deception when I was in the University. If more people have access to the resources that are on your site, the world would be a better and safer place. Sometimes converted muslims just in the wrong crowd espesially in USA. I am very active debating with lots of muslims within Face book groups. It takes time to for muslim to realize how bad is their holy book was written. Many muslim only know about the good part of Quran because that's what their imam or ustads want them to know. Many converted muslim woman dont realize how bad is their quran treated them and also their prophet said "Women only half the value of man" also " Women are the most inhibitant in the hell fire" and many more. [Leminaso Luwukan]"I am very active debating with lots of muslims within Face book groups." That is excellent. Which specific groups? What are some of your favorite questions to ask Muslims?